Zebulon Pike came through this area back in 1806, following a Spanish "trace." The next mention of the area where the Purgatoire meets the Arkansas came in 1819 when Spanish traders from Taos held trade fairs here. 1819 is when the Adams-Onis Treaty was signed making the Arkansas River the boundary between Spain and the United States. In 1825, a visiting party of trappers was attacked by a grizzly bear here. One of their members died a few days after the bear attack and was buried on the banks of the Purgatoire. Sometime in the 1840's a line camp built of cottonwood logs was constructed here and used as summer quarters by folks from New Mexico. During this time, Thomas Boggs worked for Bent, St. Vrain & Company and Lucien Maxwell, raising stock. He came to this area of the Purgatoire in 1862 and built his first L-shaped, 6-room home on the west bank of the Purgatoire at the southern end of the former line camp. That's Tom Boggs to the right. In 1866, construction of Fort Lyon started, about 3 miles north of here on the north bank of the Arkansas. At the same time, Boggs started construction of a new 9-room adobe home that blended Territorial architecture with Spanish Colonial architecture to make a pretty unique structure. 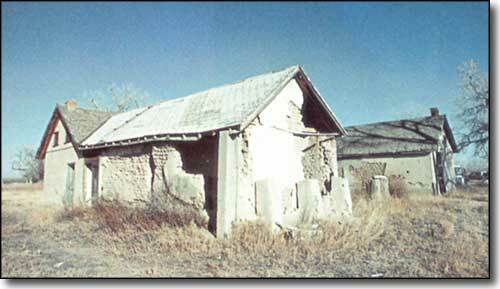 In 1867, John Prowers came and built a 2-story, 14-room adobe home (pictured below, left) at what was then known as "Boggs Ranche." Shortly after that, he was joined by his brother-in-law John Hough and his family. Then came Kit Carson and his family. The Carson's and the Hough's moved into the old, 6-room Boggs house, using three rooms each for their families. Boggs and Kit Carson were old friends and were united by another tie: Rumalda Luna Boggs, Tom Boggs' wife, who was the niece of Josefa and Kit Carson. Prowers built a "Trading House" on the east side of Boggsville and set John Hough up as the storekeeper. They sold "cloths and candles, bowie knives and groceries, canned fruits and Mexican saddles, powder and shot, boots and shoes, caps and crinolines, Worcestershire sauce, whiskey and drinks without end." They also sold prime beef from Prowers' Hereford cattle at 10 cents per pound. John Carson, a direct descendant of Kit said, "Back then you had to work together with people in order to survive. Boggsville gave permanency to the area. People knew they would be treated well there. It was a haven where they wouldn't be cheated." 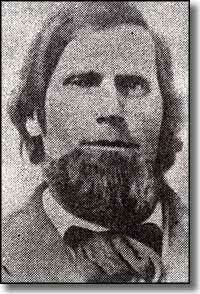 Tom Boggs raised sheep on the southern side of the Arkansas and John Prowers raised cattle on the northern side. They dug irrigation ditches and raised meat, grains, vegetables, fodder and other staples to sell to the soldiers at Fort Lyon, to new stage stops springing up along the Purgatoire and to new settlers and immigrants. 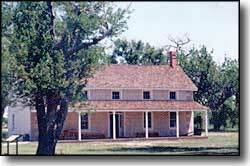 Their ranches encompassed most of the area between the modern Pueblo County line eastward to the Kansas border. Intermarriage is what allowed Boggsville to become successful in a short period of time. Intermarriage connected Americans with New Mexican trade sources and Americans connected Natives and New Mexicans with the American government. 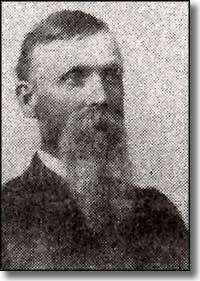 For example, in 1861, John Prowers married Amache, the daughter of Och-I-Nee, a Cheyenne subchief. Och-I-Nee was killed at the Sand Creek Massacre in 1864. As part of the fallout and aftermath of the Massacre, Amache and other surviving family members were given parcels of land near Boggsville by the US Government. This allowed Prowers to have peaceful control over the area while Amache's presence deterred several potential Indian attacks. That's John Prowers on the right. During most of this period, the Cheyenne and Arapaho were raiding wagon trains and eastern Colorado ranches as a direct result of the Sand Creek Massacre. Kit Carson was at Boggsville awaiting his appointment as Indian Agent for the Cheyenne and Arapaho in Colorado. It was here in 1868 that Josefa Carson died as a result of complications of childbirth. Shortly after, Kit was taken to Fort Lyon where he soon died from damage left over from old wounds. Peace didn't come to the area until the Cheyenne and Arapaho were removed to Oklahoma reservations in 1869. In 1869, the new town of Las Animas City was begun, about 2 miles from Boggsville on the southern banks of the Arkansas. One of the first things the new town builders did was construct a bridge across the Arkansas, connecting Las Animas City and Fort Lyon. This had a serious impact on Boggsville because most of the Santa Fe Trail traffic shifted northward and missed Boggsville entirely. Bent County was formed in 1870 with Boggsville as the county seat. The county then contained 5,500 square miles and counted 576 individuals as residents. A school was built in Boggsville in 1871 and the town served as the cultural and educational center of the county until 1874. 1873 saw the Kansas & Pacific Railroad reach the Arkansas Valley and start the new town of West Las Animas. In 1875 the Atchison, Topeka & Santa Fe also reached Las Animas and Las Animas City disappeared. By 1880, Boggsville was no longer a town but was still one of the many farms and ranches that had become common in the area by then. Today, Boggsville is a renovation project in progress. Seeing the site now, it is hard to imagine that here is where the cattle and sheep industries first boomed in Colorado. This is the area where irrigation ditches were first dug to farm various crops, including alfalfa, an experimental crop at the time. A lot of the early history of Colorado started here and slowly, the original townsite is being restored and rebuilt.